PVCu drainage systems provide strength, durability and ease of installation for use in all domestic, commercial and industrial waste water applications. Plastic pipe has a proven track record as an excellent material for gravity sewage systems and comes in a variety of sizes from 82mm to 315mm. 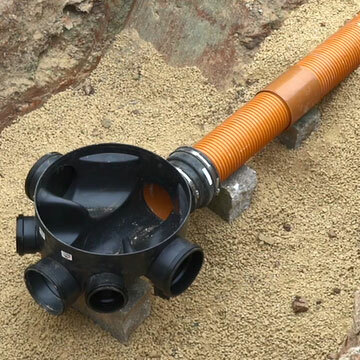 Our extensive range of plastic sewer pipe systems are engineered to provide you with the solutions you need to complete projects safely and easily. Civils and Lintels offer innovative, cost effective systems from market leading suppliers Wavin and Polypipe for all underground applications including EN1401 house drainage for foul and surface water drainage. Our range of plastic drainage includes Polypipe’s UG, Polysewer and Ridgisewer pipe systems as well as the Osma range from Wavin. Underground Pipe (MLRC) – This Underground Multilayer Recycled Core Pipe (MLRC) is available in both 110mm and 160mm diameters. A fully adoptable solution, this sustainable product allows customers to comply with environmental policy and reduce their carbon footprint. 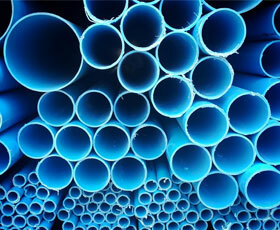 Key benefits of this system include improved environmental credentials due to lower use of raw material and foam core. Kitemarked to BS EN 13476-2 standard, certified to stiffness class SN8, compliant to meet Sewers for Adoption 7 and Sewers for Scotland regulations and is fully compatible with existing underground drainage systems. Polysewer – This range of PVCu structured wall pipes and fittings available in diameters 150-300mm. The complete system includes a range of couplings, seals, bends, junctions and accessories. Polysewer provides robust, sewer gas resistant pipes for new and replacement gravity sewer systems. Key benefits of this system include its strength and flexibility to withstand ground movement, lighter in weight for increased Health and Safety benefits and integral sockets for quicker installation and greater leak tightness. Kitemarked and BBA approved, the system is adoptable by water companies, manufactured to stiffness classification SN8 and it boasts a design life of over 100 years. Ridgisewer – This range is manufacture in high strength polypropylene offering stiffness well in excess of other plastic products combined with exceptional durability. It is available in four sizes from 400mm to 900mm. Benefits include superior chemical, abrasion and impact resistance as well as resistant to sulphate attack and corrosion by sewer gas. Osma UltraRib – Osma UltraRib is a fully socketed system of pipe and fittings which combines secure jointing with ease of installation. The pipe has a smooth inner surface and externally has a repeating pattern of concentric ribs which gives the pipe its exceptional axial rigidity and enhanced radial strength. Osma UltraRib pipe and fittings are offered in 150mm, 225mm and 300mm diameters. Pipe is manufactured to BS EN 13476- 3 complying with the requirements of: Water Industry Specification (WIS) 4-35-01 JULY 2000: Issue 1 and Kitemarked under the BSI Certification Scheme. The majority of Osma UltraRib fittings are covered by a British Board of Agrément Certificate. Osma UltraRib joints are high performance and watertight with the added benefits of no chamfering of the pipe ends and ring displacement during installation is impossible.